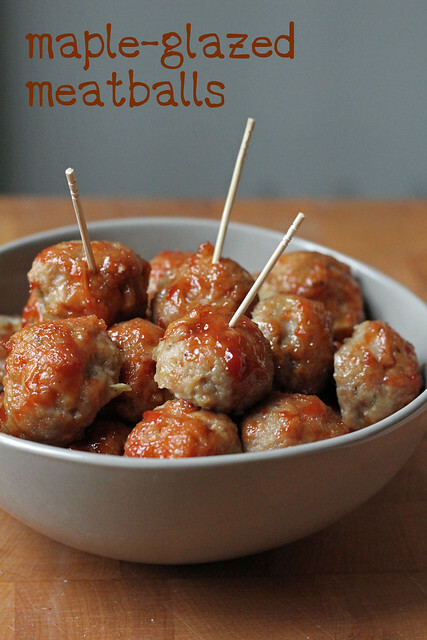 Maple-Glazed Meatballs and a BOOK GIVEAWAY! As a kid, getting breakfast for dinner was a rare and exciting treat. As an adult, I can do this any darn time I please, but it still hasn’t lost it’s excitement factor. Clearly I’m not alone in this, because there’s a new book called Breakfast for Dinner by Lindsay Landis and Taylor Hackbarth. This book has savory takes on pancakes and waffles, lots of egg dishes and even breakfast for dessert, but these Maple-Glazed Meatballs– like breakfast sausage doused in syrup– were what I wanted to try first. These meatballs are flavorful and moist. Because of their sweetness, I wouldn’t pair these with pasta, but they make a great app or a perfect TV snack. I want to send a copy of Breakfast for Dinner to one of you! Just leave me a comment (one per person, please) on this post before 4:00 pm EST on Friday, March 8 and I’ll randomly choose a winner from the list. Be sure your e-mail address is correct so I can contact you. Steph’s Note: The original recipe called for ground pork, but I used ground chicken instead. If you do, too, you may find that you need to add extra tablespoon of so of breadcrumbs and give the mix about a 30 minute rest in the fridge before portioning into meatballs. -Line a baking sheet with foil. -Heat the oil in a large skillet over medium heat. Add the onion. Cook until translucent, 7 to 10 minutes. Stir in apples, ginger and garlic. Cook 1 to 2 minutes. Remove from heat and cool. -In a large bowl, combine pork, egg, breadcrumbs, milk, maple syrup, fennel, red pepper flakes, salt and black pepper. Add the cooled onion mixture. Mix with your hands until uniform. Roll by tablespoonfuls into 1-inch balls, or use a small ice cream scoop to portion. Arrange on prepared sheet. Refrigerate for 30 minutes. -For the glaze, whisk together maple syrup, tomato paste, apple juice and vinegar in a small saucepan. Bring to a simmer. Cook over medium heat, stirring occasionally, until reduced by half, about 5 to 7 minutes. Remove from the heat and cool slightly. -Brush meatballs with half of glaze. Bake 10 minutes. Brush with remaining glaze. Bake 5 to 7 minutes longer or until cooked through (internal temperature of 160°F. Serve warm. I could eat breakfast all day along, including for dinner 🙂 Love the look of those meatballs. oooh, I’ve love this cookbook! my email is mcm488 at gmail dot com! Mmm! These look amazing! I love breakfast for dinner as well, so this cookbook looks right up my alley. Will have to check it out! I love Breakfast also. I love the savory aspect of it! Looks like a great book for my collection! Breakfast is yummy – next to dessert. Together = a great meal! The meatballs look fantastic! My husband makes them with cranberry sauce. That looks like my kind of book! Love breakfast, and can’t wait to try these meatballs. Mmm…these meatballs sound so yummy! The hubby, kids, and I love meatballs – so we’ll definitely be giving these a try. LOVE breakfast for dinner! Yum! Yes please! I want to go to sleep happy with breakfast! My college friends and I love having breakfast for dinner on busy nights! Those meatballs are definitely going on the menu next week! Yum. Those look marvelous; what do you think if you had Soba noodles and cucumber with them? I have heard of that book too; sounds like good fun. What a fantastic recipe! I sometimes fry pork in a maple syrup marinade for a special treat so I am very excited to try this out. That book sounds fantastic, there is nothing better than a fried egg on toast for a comfort-eating dinner. We had breakfast for dinner all the time when I was growing up, but I seldom have it now. I need inspiration! We rotate either Blueberry Steel Cut Oatmeal or Blueberry Pancakes for dinner! loving the title of your new book! congrats on the effort! those meatballs look devine! Perfect for our (hopefully!) last snowday of the school year!